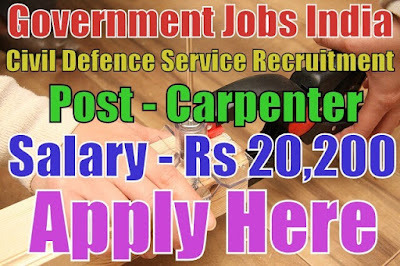 Civil Defence Service has published 64 Coy ASC (Sup) type C recruitment notification 2017 for 04 carpenter, tinsmith, labour / industrial mazdoor posts. All legible and interested candidates have to apply on or before (27-03-2017). Further more information about salary details, application fees, educational qualifications and all other details / information about these posts is mentioned in detailed below. Job Location - Anywhere in India. 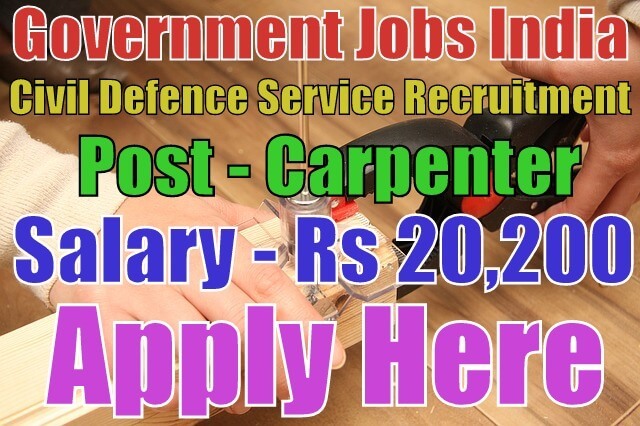 Salary / Pay and Grade pay - For post(1&2), the payable salary will be Rs 5,200 - 20,200 with Rs 1,900 grade pay and for post(3), the payable salary will be Rs 5,200 - 20,200 with Rs 1,800 grade pay. Age Limit - For civil defence service recruitment, candidate age should be 18 - 25 years. To know more information about age details as post wise, go to detailed advertisement mentioned in last. Educational Qualification Details - Candidate must have done matriculation,ITI or it's equivalent / relevant / higher qualification from a recognized board or university. Candidates must have some experience in their fields. To know more about qualification details per post, click on detailed advertisement. Selection Method - For civil defence vacancies, candidates will be selected on the basis of their performance in written test, skill test, medical fitness, verification of character and antecedents. Candidates should be prepared for these tests. Application Process - All legible and interested candidates have to download application form from official website ndrfandcd.gov.in or from given detailed advertisement. After downloading and filling the application form, candidates need to send application form with relevant / needed testimonials(which are completely mentioned in detailed advertisement) super scribes "Application for the post of ' Name of Post' " to the given desired address. Administrative Officer, 64 Coy ASC (Sup) Type 'C', No. 1 Dr. Coyaji Road, Opposite - Maratha War Memorial, Pune - 411001. Application Fee - The application fee will be Rs 25/- only. Important Note - Application forms received after due date will not be entertained under any circumstances. Application forms must reach before last date.